Fascinating and diverse, savanna ecosystems support a combination of pastoral and agropastoral communities alongside wild and domestic herbivores that can be found nowhere else. This diversity has made the study of these areas problematic. Ecosystem Function in Savannas: Measurement and Modeling at Landscape to Global Scales addresses some of the discontinuities in the treatment of savannas by the scientific community and documents a range of measurements, methods, technologies, applications, and modeling approaches. Based on contributions from leading authorities and experts on savanna systems worldwide, the book describes the global savanna biome in terms of its broad ecological properties, temporal dynamics, disturbance levels, and human dimensions. 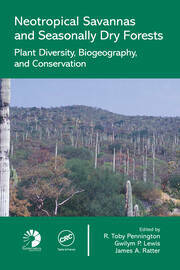 The text examines carbon, water, energy, and trace gas fluxes for major global savanna regions. It looks at quantitative surface properties of savannas that can be retrieved using remote sensing and numerical approaches used to explore savanna dynamics. 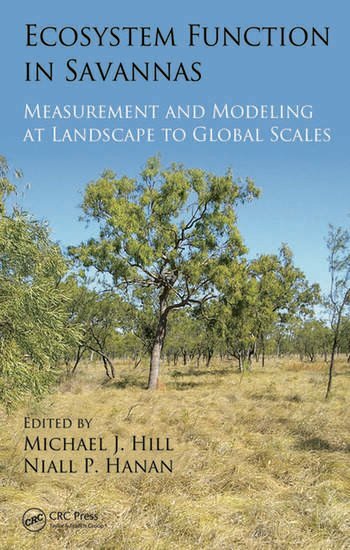 The authors also discuss how savanna modeling and measurement approaches might be unified. By presenting this confluence of information in a single resource, the book provides a platform for examining synergies, connections, integrative opportunities, and complementarities among approaches and data sources. This information can then be used to harmonize measurement and modeling methods among scales and across disciplinary boundaries. The book builds a bridge across the markedly different perspectives on savannas by which ecologists, biogeochemists, remote sensors, geographers, anthropologists, and modelers approach their science. Michael J. Hill received his PhD from the University of Sydney, Australia, in 1985. He spent 12 years in the CSIRO Division of Animal Production and then 6 years in the Bureau of Rural Sciences in the Department of Agriculture, Fisheries, and Forestry of the Australian Government, where he carried out research in and contributed to the management of the Cooperative Research Centre for Greenhouse Accounting. In 2006, he became a professor of earth systems science in the Department of Earth Systems Science and Policy at the University of North Dakota. He has a background in grassland agronomy, but he has been working with spatial information and remote sensing of land systems for the past 17 years. Dr. Hill has published widely on agronomy, ecology, biogeography, and production of grasslands, and radar, multispectral, and hyperspectral remote sensing of grasslands, and more recently he has been involved in the development of scenario analysis models for assessment of carbon dynamics in Australian rangeland and savanna systems. His current interests are in the use of MODIS land product data in model-data assimilation, application of quantitative information from hyperspectral and multiangle imaging to vegetation description, multicriteria and decision frameworks for coupled human–environment systems, and methods and approaches to application of spatial data for land use management. Niall P. Hanan received his PhD from the University of London in 1990. Since 1998, he has been a research scientist in the Natural Resource Ecology Laboratory at Colorado State University. His research interests include savanna ecology function and dynamics; biosphere–atmosphere interactions and global change; ecophysiology of carbon, water, and energy exchange between plants and atmosphere; and radiative and aerodynamic transfer in vegetation canopies. Dr. Hanan’s current research centers on the ecology of semiarid grassland and savanna systems in Africa and North America. Ongoing projects include research into the ecological determinants and dynamics of tree–grass interactions and coexistence in African savannas; the measurement of biosphere–atmosphere exchange of water and carbon and the implications for competitive interactions and productivity in savannas; impact of land use change in semiarid systems on long-term carbon and water dynamics; and the greenhouse gas implications of cattle and intensive cattle production systems. In 2007, he spent a year as a U.S. Department of State Fulbright Scholar at the University of Bamako and the Institut Polytechnique Rural in Mali.